They're not Fairy Rings of course, but rather enclosures to keep the sheep from eating the plants? To start the week we visit Valentia in Co. Kerry once again and this time to "Glenleam" and what appears to be an hotel or guesthouse. Mr. French appears to have been blessed with sunshine on his visits to the island and got some lovely images of that place at that time. This cabinet sized shot was taken after a trek it seems as he seemed to prefer Royals when he was on ground level! Date: Catalogue range c.1865-1914. Possibly end of range c.1900 or later. Glanleam was built as a linen mill in 1775 and converted into a house by the 19th Knight of Kerry, Sir Peter Fitzgerald (1808-1880). He also laid out the subtropical garden. Nowadays, Glanleam gardens can be visited from April to October. And you can sleep in Glanleam House. I think those rings are likely damage to the negative rather than sheep pens. They do not appear on the OSI 25" or the older 6". A LONG WAY ROUND. Here is a curious example of how the telegraph has reduced the size of the earth, says The Manchester Guardian. Not long ago a woman on Valentia Island was taken suddenly ill. The island lies 10 miles off the west coast of Ireland, and is peopled mainly by the operators and engineers who look after the cables laid between that point and Newfoundland. The nearest doctor was the resident practitioner at another large cable colony at Waterville, on the mainland. 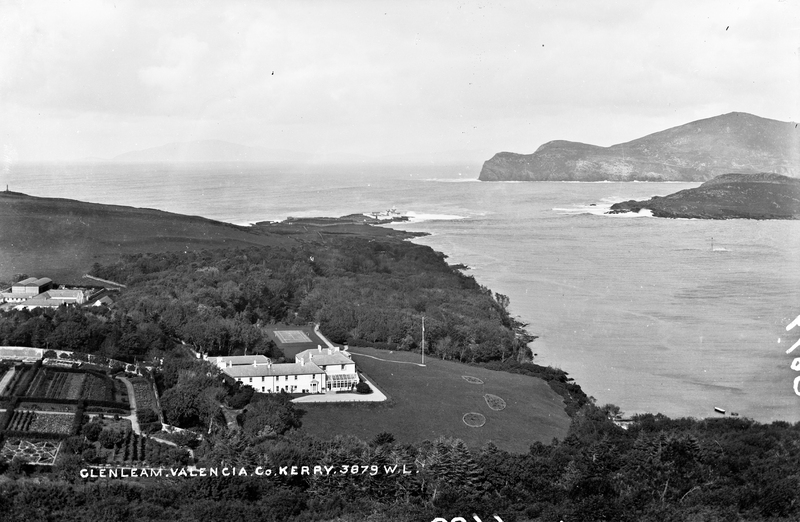 Strange to say, there is no means of communication between Valentia Island and Waterville, possibly because the two systems of cables are controlled by different interests. But the cable operators at Valentia were not to be beaten. They asked their Newfoundland operators by cable if they could communicate with their end of the Waterville cables. The reply was that the two Newfoundland offices were connected by telephone. Thereupon the Valentia men sent a message to Waterville, 10 miles off, via Newfoundland, asking a doctor to attend the sick woman. The. doctor arrived within two hours, and landed amid cheers from the little colony of operators. There is a photosphere in Google up that the monument at top left. I can not find a date on that one yet. This page on Atlantic Cable History suggests the monument is to Sir Peter FitzGerald, 19th Knight of Kerry, who died in 1880. From Black's guide to Killarney and the South of Ireland (Published 1909) "There is a great variety of scenery in and around Valentia, in which is situated Glanleam, the residence of Sir Maurice Fitzgerald, Knight of Kerry (a descendant of the "Black Knight"), about 2 miles from the Royal Hotel and Post Office. The grounds of Glanleam contain some rare shrubs and the largest fuchsia in the kingdom"
I think we are definitely at the end of the 1865-1914 range. [https://www.flickr.com/photos/beachcomberaustralia] Not so much a red herring as a world record? Imagine at that time contact across the Atlantic twice and a telephone call at one end to fetch a doctor. Never before was a doctor called across such a distance! Flickr is just amazing!